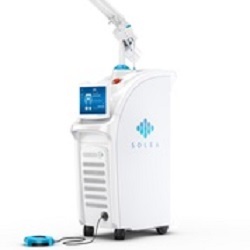 Solea® is the number one selling hard, soft and osseous tissue laser in dentistry. It’s fast, precise, virtually noiseless and anesthesia free for the vast majority of procedures. Patients love the experience. Dentists love the improved efficiency and practice growth. This is the laser you’ve been waiting for. Solea, the first CO2 dental laser cleared by the FDA for hard and soft tissue procedures, can operate virtually noise-free. Sit back and enjoy the sweet sound of silence. Solea lets us perform virtually all of our procedures without anesthesia, which means much less of the “fat lip” you are used to when you leave. Plus, this means a speedier appointment, which allows you to be in, out, and on with your day. Ask us about our new Solea dental laser during your next visit.